I can see us playing some friendly games in Japan this summer. Are Milan going to renew their shirt deal with fly Emirates? Osaka, Japan - 11 April, 2014 - Toyo Tire & Rubber Co., Ltd. (Headquarters: Osaka, President & CEO: Akira Nobuki) announces that an agreement has been concluded today to support AC Milan (Associazione Calcio Milan), the renowned world-class football club, as a Premium Sponsor, commencing from today until June 2016*. Toyo Tire & Rubber is involved in a wide variety of business activities on a global scale with a focus on the production and sale of tires as its' main activity. Our management is currently shifting to a stage of further growth based upon the strengthening of various business bases to which we have devoted attention over the past few years. Seizing the opportunity of this business expansion, we will begin to actively take advantage of sponsorship of a sport that boasts overwhelming international popularity to influence our global branding content. AC Milan, a club in Serie A, one of the leagues at the pinnacle of football competition, is a prestigious club, ranked number one in the world in international titles. The team always demonstrates an all-out, aggressive style of play which transcends the weight of the tradition the club has built. We believe that supporting this powerful, individual and genuinely proficient club will contribute to improving the global presence of the TOYO TIRES brand and, in turn, will allow us to more clearly bring out the potential premium image of the products we offer. This partnership can be expected to bring significant advantages to the TOYO TIRES brand in the medium term in each market where there is impassioned potential for football such as the Middle East and Russia, where we are contemplating market expansion, China, which is positioned as a key market, Southeast Asia, and Japan in addition to the EU, with a focus on Italy, home to the Serie A league. The importance of our global branding strategy has been increasing in light of Group business development. Supporting a club home to top athletes is a new opportunity to further increase brand prestige for all TOYO TIRES stakeholders including our customers around the world; we are going to actively publicize our partnership with AC Milan at a variety of touch points. "We are delighted to welcome Toyo Tires as a premium partner of the club. Our shared values of performance and excellence lie at the heart of this relationship. It is also a Partnership which reflects the global reach of our Club and we are honoured to be working with a global brand such as Toyo. We look forward to building even stronger links with our many fans in Asia through this partnership“. "Companies must win the support of customers amidst fierce global competition. We wish to superimpose ourselves as a global player in the tire industry through the beloved AC Milan club, nurtured under the strict eyes of the Milanista, unforgiving of sloppy performances, and obtain a great deal of knowledge. The corporate attitude of TOYO TIRES, committed to the world, is expressed in our brand statement "driven to perform" (in pursuit of the best performance). We are honored to take this opportunity to support AC Milan, a club that conforms to our spirit, and we will share our heart as one of the many fans around the world to build a bridge of support." About Toyo Tire & Rubber Co., Ltd. Founded in 1945. Capital of 30.4 billion yen. Toyo Tire has been developing a broad range of products with a focus on automobile tires such as automotive anti-vibration rubber, urethane products, and industrial rubber products, etc. based on the company's original technology. Toyo Tire has production bases in Japan, the U.S., China, and Malaysia, and supplies products to markets around the world. In the year ended December 31, 2013 the company recorded a record high 370.2 billion yen consolidated net sales and 37.2 billion yen operating profit. The company expects to break this record by recording 400 billion yen consolidated net sales and 40 billion yen operating profit in the year ended December 31, 2014. As well as providing the ultra-high-performance tire flagship brand "PROXES" worldwide beginning in Europe, Toyo Tire will roll out its "NANOENERGY" series of fuel-efficient tires, which have acquired the highest grade under world-leading Japanese tire environmental performance standards, globally. Thanks to the company's advanced technical capabilities, its large diameter SUV / pickup truck tires also have a good reputation and many fans in the U.S.
Milan will receive around €3m from the new partnership deal with Toyo Tires. NOTE --> Just to clarify: The €3m that Milan will receive from Toyo Tires is per year - i.e. €6m in total. Last edited by Sod-Lod; 13-04-2014 at 14:31. Il brand giapponese opera su vasta scala a livello globale soprattutto nel settore della produzione e della vendita di pneumatici, prodotto principale del marchio. L’accordo è stato finalizzato grazie al contributo di Infront Sport & Media, azienda leader nella gestione dei diritti sportivi. Negli ultimi anni Toyo Tire ha deciso di potenziare la sua espansione attraverso nuove attività, tra cui la sponsorizzazione di uno sport tra i più amati al mondo, il calcio, per poter così intensificare in maniera più efficace le strategie di branding della compagnia. L’AC Milan, che milita in uno dei campionati più famosi al mondo, la Seria A, vanta il maggior numero di titoli internazionali e ogni domenica mette in campo la propria personalità attraverso uno stile di gioco corretto e all’altezza della sua lunga tradizione. Il connubio tra il marchio giapponese, primo Premium Sponsor nipponico della storia, e il Club rossonero permetterà a Toyo Tire di migliorare la presenza del brand in Italia, potenziando così anche l’immagine dei loro prodotti. Questa partnership darà anche l’occasione a Toyo Tire di avvicinarsi sempre più ad altri paesi, grazie anche alla Coppa del Mondo FIFA 2014, dove l’attenzione e l’entusiasmo nei confronti del calcio raggiungeranno il loro picco su scala mondiale. Questa sponsorizzazione potrà quindi dare accesso anche ad altri mercati, non solo Russia e Medio Oriente, dove ogni anno la passione nei confronti del pallone cresce sempre di più, ma anche Cina e Sud-est asiatico, considerati territori di grande interesse. Le strategie di branding globale di Toyo Tire stanno aumentando sempre più grazie allo sviluppo del business del Gruppo. Il sostegno a un Club che annovera tra le proprie file calciatori di fama internazionale rappresenta una nuova occasione per poter aumentare ulteriormente il prestigio del marchio nei confronti dei clienti di tutto il mondo, nonché di tutti coloro che hanno a che fare con Toyo Tire. Proprio per questo, verrà data ampia visibilità alla partneship, in diversi touch point. Queste le parole del Top Management di AC Milan, Toyo Tire e Infront Italy. ■ Il Presidente della Toyo Tire & Rubber Co., Ltd., Akira Nobuki ha commentato così: “Nel mezzo di una competizione spietata, le aziende devono conquistare e fidelizzare la propria clientela nel modo migliore. La nostra compagnia vuole imitare l’immagine dell’AC Milan, per rimanere sempre in alto e non abbassare mai le proprie performances, esattamente come si aspettano i tifosi rossoneri dai loro campioni. La filosofia aziendale che Toyo Tires rivolge al mondo è espressa dal nostro motto “driven to perform (perseguire le migliori prestazioni). È un grandissimo onore avere l’occasione di poter collaborare con l’AC Milan, sostenendolo grazie all’unione d’intenti e arrivare cosi a toccare i cuori dei tifosi di tutto il mondo.”. ■ “Siamo molto soddisfatti di aver portato l’attenzione di un brand giapponese e di profilo internazionale come Toyo Tire & Rubber al mondo del calcio – afferma Marco Bogarelli, Presidente di Infront Italy – L’accordo di sponsorizzazione concluso con AC Milan in qualità di Premium Sponsor testimonia un’attenzione sempre crescente per le sponsorizzazioni nel mondo dello sport, che anno dopo anno garantiscono alle aziende un efficace ritorno sull’investimento. La nostra leadership nel mercato delle sponsorizzazioni e della gestione dei diritti ha permesso di creare sinergie tra aziende internazionali e brand di alto profilo come AC Milan, travalicando i confini dei singoli mercati di riferimento, per raggiungere visibilità e creare brand awareness a livello globale”. Un numero difficile da dimenticare. The daughter of Rossoneri President Silvio believes the selling of team merchandise and securing sponsorship is key to the club’s long term plans. The agreement was facilitated by Infront and announced at AC Milan's official Sponsor Day. Milan – Lawson, Inc. (based in Shinagawa, Tokyo), Japan’s leading convenience store, has concluded an agreement to support AC Milan within the territory of Japan. Infront Sports & Media, the leading international sports marketing company, facilitated the partnership for the Italian club that holds 18 officially recognised UEFA and FIFA titles – working in cooperation with Dentsu, a leading international advertisement agency. The agreement was announced today at Casa Milan, the headquarters of AC Milan, at the official Sponsor Day – carried out by the Lega Serie A club and Infront. The AC Milan team has visited Japan six times since the 1980’s and has triumphed three times as the FIFA Club World Cup champions. As a result, AC Milan is extremely popular amongst all age groups in Japan. Lawson operates nearly 12,000 stores in Japan and has expanded overseas including China, Indonesia, Thailand and Hawaii. Under the mission statement 'Creating Happiness and Harmony in Our Communities', Lawson enriches and supports the lives of its customers by operating closely with local neighborhoods, providing entertainment and sports related services. The subsidiary company, Lawson HMV Entertainment (knows as LHE), is tasked with the installation in all Lawson sales outlets with the multimedia terminal “Loppi”, which allows you to not only book concerts of world famous artists, but also buy CDs/DVDs, “TOTO” sports lottery tickets, various transport tickets and it is also used for the purchase of basic services for sporting events like city marathons. What is more, “Loppi” allows every shop to act as a health point for each neighbourhood. Ken Sakamoto, President and Representative Director of Lawson HMV Entertainment, commented: “We are honored to have the opportunity to support the world’s most beloved sport and specifically a club that has always led the world of football. Barbara Berlusconi, Vice President and CEO of AC Milan, said: “We are delighted to welcome the Lawson Group as the Official Partner of the club in Japan. Emirates and AC Milan Score New Sponsorship Deal. MILAN- Emirates and AC Milan have today agreed a new five year sponsorship deal, extending the airline’s presence on the club’s shirts until the 2019/2020 season. The new sponsorship deal with Fly Emirates is worth €18m + bonuses per year for 5 years until 2020 (€100m in total). During a press conference at the Club’s headquarters, Casa Milan, Sir Tim Clark, President Emirates Airline and Barbara Berlusconi, Vice President and CEO AC Milan, discussed the synergies between these global powerhouses which have made the partnership so successful. “It’s a double celebration for Emirates today as we deepen our relationship with this great city, heralding two iconic moments, the renewal of our AC Milan sponsorship and introduction of our dedicated A380 service to Milan this evening. It is only fitting that we are re-signing with Italy’s most well-known football club, on the same day we land the world’s largest aircraft – our flagship A380 - in Milan - said Sir Tim Clark - As the most awarded football club in the world, AC Milan’s strong global appeal and ambitious approach to the game closely mirrors our own, making them an incredibly valuable partner for our brand. “This is an important day for AC Milan, the city of Milan, but also for Italy. An important international player such as Emirates decides, in fact, to invest with conviction in AC Milan and in Italy. We share many common values: quality, style, innovation, professionalism, and a winning spirit. Emirates, with its aircraft and infrastructure, connects the whole world. In addition to the Emirates brand appearing on the front of AC Milan’s playing and training kits, the new agreement also includes branding within San Siro Stadium, The Emirates Lounge - a dedicated in -stadia hospitality suite, sponsorship of the youth team as well as a number of marketing rights. Emirates is a major partner in the world of sports, sponsoring clubs such as Real Madrid, Arsenal, and Paris Saint Germain, as well as many other sports like F1, rugby, tennis and golf. Emirates first signed a sponsorship agreement with AC Milan in September 2007. The following year, the relationship was elevated to Top Institutional Sponsor. The prestigious shirt sponsor deal, spread over five years, first became visible in the 2010/2011 season. As one of the most successful clubs in Europe, AC Milan is an integral part of Emirates’s sponsorship portfolio which extends across multiple sports and cultural events. AC Milan will visit Dubai later this month to compete in a friendly match against Emirates sponsored Spanish club Real Madrid. The fourth iteration of the Dubai Football Challenge will take place at The Sevens on Tuesday 30th December 2014. 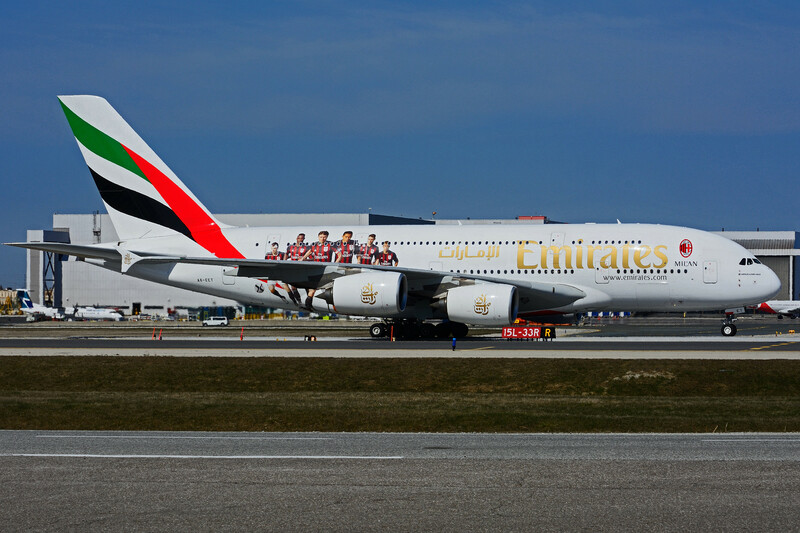 Emirates first began flights to Milan in April 2000. Since then the airline has increased its flight frequency to three daily, offering non-stop flights to both Dubai and New York from Milan Malpensa International Airport. Last edited by Sod-Lod; 01-12-2014 at 14:43. AC Milan and Sanrio, the company behind Hello Kitty, to release a new exclusive collection. MILAN – Sanrio, the global company behind Hello Kitty, and AC Milan, thanks to the master licensor adidas Italia, have both teamed up for an exclusive co-branding project. 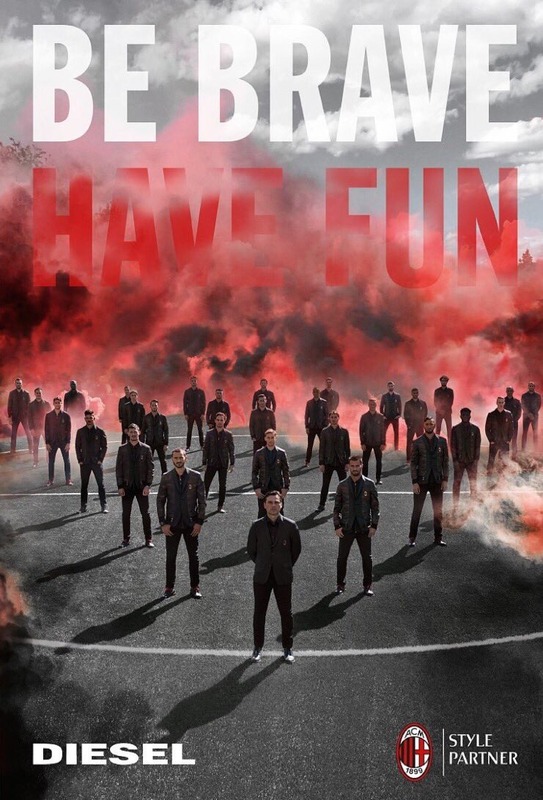 Together, the two parties will create a new collection which will be launched mid-April at the San Siro. Hello Kitty will also be pitch-side for the occasion! The partnership was announced for the first time at the Trade Show Hong Kong in January earlier this year and this exclusive collection is aimed at the club’s female fans of all ages bringing together the Hello Kitty brand with that of AC Milan. "I am very satisfied with this collaboration." - Paolo Casarini, Licensing Director for Sanrio GmbH - "The idea to associate a female soul to a top level male sport came a while ago with AC Milan. Today, and with lots of female fans in the sport, the new collection has a natural target. A sports clothing line and accessories to all female fans will be launched from next September." "Milan has always associated itself with Italian and international companies that represent excellence in their sectors - Jaap Kalma, Milan Commercial Director - "For this reason we decided to join forces with a brand like Hello Kitty, a prestigious and important character, and what is more highly adored by young people all over the world. The collaboration with the Sanrio Team has been challenging and has brought excellent results. In addition, we’re thinking about organising other initiatives with Hello Kitty and our club mascot Milanello and we will see them together soon at San Siro with our fans. We’re certain that this character will be liked by the Milan fans and from this we will see several other interesting initiatives." The project will be launched in Italy and then taken all over the world starting with Asia and Japan, the home of Hello Kitty. In the second half of 2015, the collection will be available in the Milan Stores, online at www.store.acmilan.com and selected retailers nationwide. The club is pleased to announce a strategic partnership with Le Sports. Beijing, China ? Milan, Italy. February 4, 2016 ? Le Sports and AC Milan football club announced a wide-ranging partnership which results in China?s top internet-based eco-sports company becoming the official new media partner of AC Milan in China mainland for three consecutive seasons from 2015/16 to 2017/18. The partnership was finalized thanks to Infront Sports & Media, marketing agent of AC Milan. The strategic alliance is highlighted by the exclusive streaming of the official AC Milan club channel content in China mainland for the first time. Meanwhile, Le Sports have been granted various advertising and promotional rights as the ?Official Partner? and the ?Official New Media Partner? of AC Milan in China. Barbara Berlusconi, CEO of A.C. Milan commented: "This new sponsorship deal is an important achievement for A.C. Milan. We bring the history and prestige of our club to China, and Le Sports will promote and enhance the experience of our contents through their highly technological platform. With this partnership we further reinforce a commercial relationship with a country in which AC Milan is the top football club with the highest number of fans and a greater digital growth than other major European clubs. For us China is a primary objective and all our efforts are focused on enhancing our presence in that area." Mr. Lei Zhenjian, the CEO of Le Sports, said of the partnership, "We are honored to announce this great partnership with AC Milan, which is such a great football club and has so many supporters in China. As is known to all, Le Sports is also the exclusive new media broadcaster of Serie A in mainland China. We believe such partnership with AC Milan will to the largest extent promote the influence of the club, as well as the Serie A, in China." Marco Bogarelli, President Infront Italy, commented on the agreement between AC Milan and Le Sports, "that this partnership demonstrates how football is increasingly gaining importance into the Chinese market and how valuable brands such as AC Milan can give visibility and recognition to media companies. Infront leadership in the sponsorship market and its stronger presence into the Chinese market, allow us to create synergies between Chinese and global brands, in order to go beyond each individual reference market borders, to reach visibility and create global brand awareness." The partnership with AC Milan is the latest significant achievement of Le Sports, and adds to other exclusive media rights deals, including the Wimbledon from 2016-2018, the English Premier League in Hong Kong from 2016-2019, as well as the five-year global partnership with ATP.